Tomorrow (Wednesday) marks the 108th anniversary of President Ronald Reagan’s birthday — he was born on February 6 in 1911. 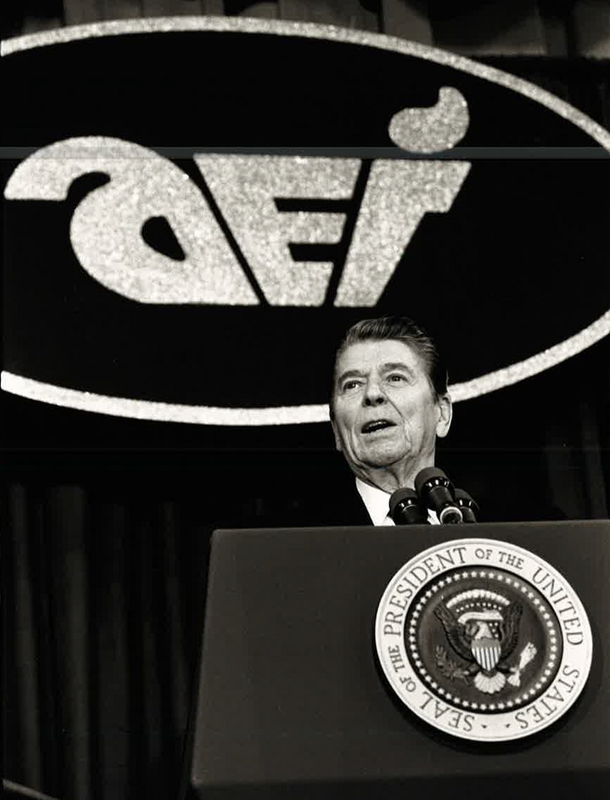 Here are a few items to honor and celebrate the birthday of the 40th US president, President Ronald Wilson Reagan (pictured above at an AEI event, year unknown). 1. Amazingly, in the entire history of the United States, there have only been two sitting US presidents who have visited the New York Stock Exchange (NYSE) while in office: Ronald Reagan in 1985 and George W. Bush in 2007. After his presidency, Reagan visited the NYSE again in 1992 with Mikhail Gorbachev to mark the exchange’s bicentennial. On March 28, 1985, President Ronald Reagan made his first of two visits to the NYSE to salute the robust American expansion, as well as the central role of the New York Stock Exchange as the nerve center of entrepreneurial capitalism (see bottom photo above). 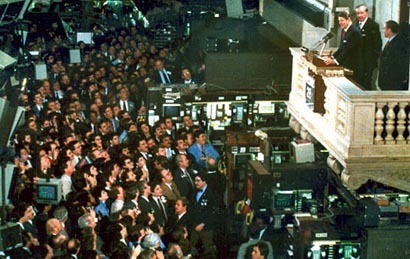 President Reagan was the first sitting U.S. president to visit the NYSE. “We who live in free market societies believe that growth, prosperity and, ultimately, human fulfillment are created from the bottom up, not the government down. Only when the human spirit is allowed to invent and create, only when individuals are given a personal stake in deciding economic policies and benefiting from their success – only then can societies remain alive, dynamic, prosperous, progressive and free. “Trust the people. This is the one irrefutable lesson of the entire post-war period, contradicting the notion that rigid government controls are essential to economic development. The societies that have achieved the most spectacular, broad-based progress are neither the most tightly controlled, nor the biggest in size, nor the wealthiest in natural resources. No, what unites them all is their willingness to believe in the magic of the marketplace. Comment: As I recommended in a 2016 CD post shortly after Trump was elected president, it would be a powerful symbol of his support of our country’s market-based economy and its “nerve center of entrepreneurial capitalism” on Wall Street if he were to visit the floor of the New York Stock Exchange as soon as possible. So far, no visit…. Bottom Line: Happy 108th Birthday, President Ronald Reagan! Over the years, I’ve featured Reagan frequently on CD, e.g., see these posts from 2018 here, here, here, here, here, and here.